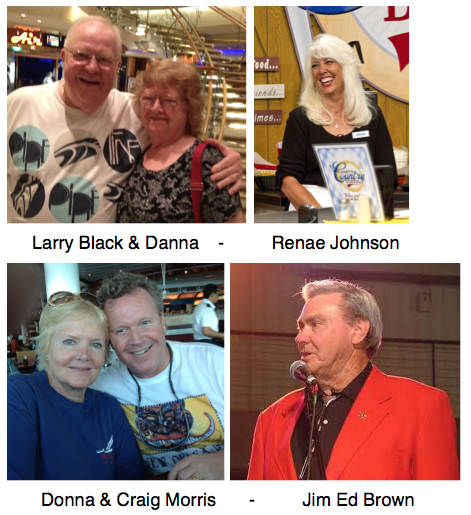 LARRY BLACK, RENAE JOHNSON, DONNA and CRAIG MORRIS and JIM ED BROWN will be interviewed on this, our second cruise show. Jim Ed Brown is a recording star and a member of the Grand Old Opry. This entry was posted in Danna's Radio Diner Archive and tagged Country Music, Country's Family Reunion, Donna & Craig Morris, Jim Ed Brown, Larry Black, Larry's Country Diner, Renae the waitress, The Rhodes Show, Traditional Country Music. Bookmark the permalink.